In the unreconstructed world of professional boxing – a place where fists and money do all the talking – Manny Pacquiao is one of the few renaissance men to be found. Actor, singer, politician, businessman, basketball coach and…now what was it…oh yes, the one and only man to have been a world champion across eight weight divisions, the Filipino secured his legendary status in and out of the ring a long time ago. So long, in fact, that the only blot on his career has been its duration. Boxing is awash with examples of truly great fighters reduced to junkie status, hanging around for that last big hit. In the ring, alas, that hit is all too literal and often exponentially damaging. For Pacquiao, the damage has been more to his reputation than his health. In 65 fights across three decades, he has lost just six times. But three of those defeats have come in his last six bouts, including a chastening sixth-round knockout at the hands of Juan Manuel Marquez – an opponent he’d not lost to in three previous fights. 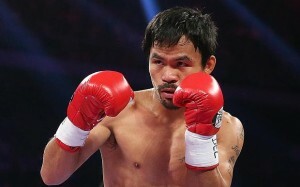 Whatever the more feverish claims of some, Pacquiao has never ducked a fight. Just reeling off a list of some of his opponents over the years is testament to that: as well as Marquez, there’s Barrera, Morales, De La Hoya, Hatton, Cotto, Mosley and Bradley. Big names from featherweight up to welterweight. But the biggest of them all has created the biggest stink. Floyd Mayweather Jr. Pretty Boy. Money. The dancing king. For those who don’t view boxing as simply brutality and knock-outs, Mayweather is arguably the greatest of them all; a sweet scientist who uses his speed, athleticism and ring craft to defend just as much as to attack. The hicks and beer-fuelled macho boys might view Mayweather as yellow, on his bike and spoiling out of terror not technique, but to the more educated he is a man who brings depth and subtlety to a sport so often short and savage. But boxing is also corrupt; a messy mafia of vested interests and deal makers often not fit to be walking the streets as free men, let alone as the holders of the purse strings in a major international sport. So the fight that had to happen, involving two of the greatest boxers of all time, didn’t happen anywhere near when it should have done. And the outcome will forever tarnish Pacquiao’s legacy. ‘The Fight of the Century’ took place six years later than it should have done for a variety of reasons, none of them particularly savoury. Two greats long past their best played out a predictable conclusion. 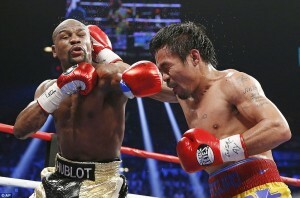 Pacquiao hustled and harried, Mayweather danced and countered and won at a canter. Would it have been the same with both men at their best? Hard to say for sure, but probably not. A peak Pacquiao, not slowed by big money wars and a knockout on the wane, would surely have troubled Mayweather more, while the American, at the top of his game, would have picked off his stalker with even more relentless precision, as he has done to all-comers across 49 unbeaten bouts. There is talk of a re-match. If it happens, it will surely be the last fight for both in their glittering careers. And it will surely end in the same manner as the first: unspectacular and unedifying. When Pacquiao finally calls it a day, he will be held in much fonder regard than Mayweather. His guts, his astonishing across-the-weights achievements and his personality make him so much more attractive than the unlikeable American. And even the fact that the Filipino didn’t call it a day so much earlier will probably be viewed as an attribute, a confirmation of his drive, hunger and warrior spirit. He will hopefully go on to great things as a politician in his country, all of them fully earned. The only hope is that if he learns one thing from a great, but tarnished, boxing career, it is realising that quitting when you’re truly ahead is the real stuff of champions. We have a great selection of Manny Pacquaio-signed items, including gloves and framed photographs, part of our superb boxing range. And all UK orders come with FREE postage. This entry was posted in Boxing, Sport on October 13, 2015 by [email protected].